Happy holidays everyone. I love this time of year - even though it tends to get a bit cold. But to offset to dropping temperatures, there's an increase in holiday spirit! 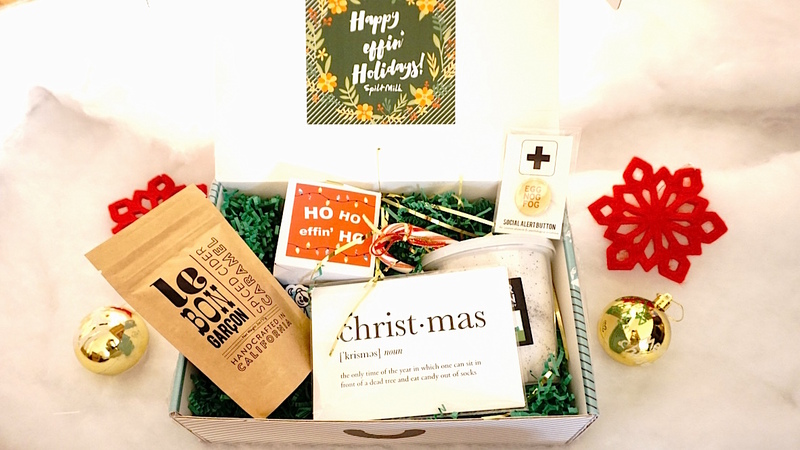 I received this gift box from Spilt Milk and it's amazing! It's like nothing I've seen before and if you have a hard time finding a unique and creative gift for your friends (like me), look no further. I love the whimsical and fun packaging. I got a really delightful and warm feeling as I was opening the package. 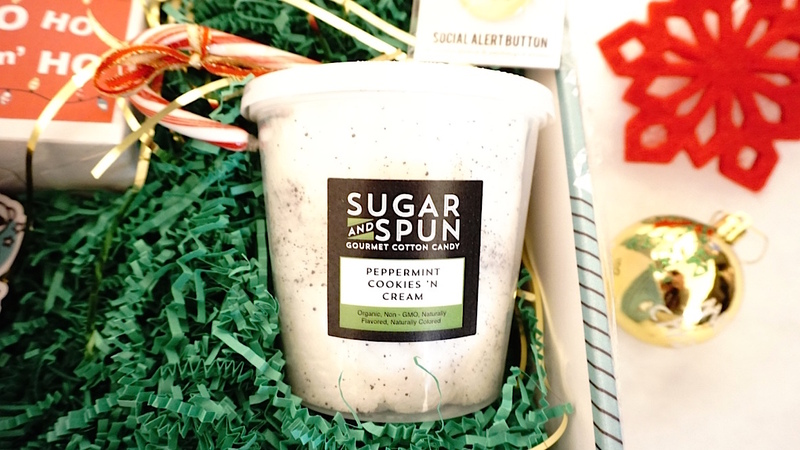 My favorite is the Peppermint cookies and Creme Cotton Candy, which I happen to be stuffing my face with as we speak. 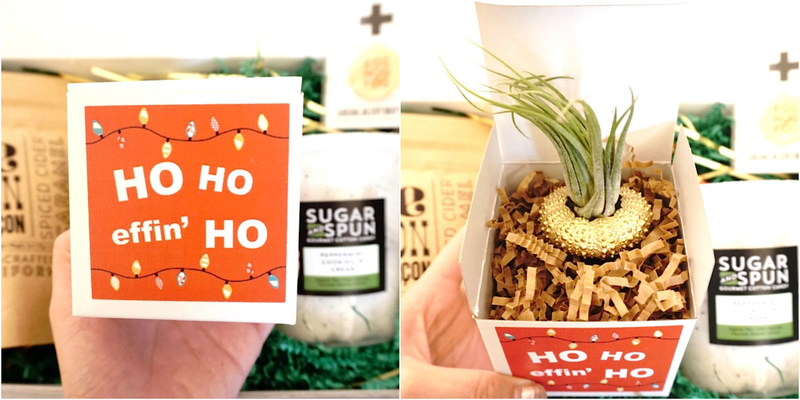 The Christmas greeting card is hilarious, and I really love the thoughtful touch of adding in an air plant. I've been meaning to get a bonsai tree for a while now, but this air plant is a perfect first step towards developing my green thumb. I've never received anything as unique as this gift box from Spilt Milk. All of the included products are carefully selected and really play well off each other. Check them out here - last day to order for guaranteed Christmas delivery is December 20th! I love giving presents that are meaningful and that people will actually use, and almost every year I find myself scrambling to cross off the last bit of my shopping list. 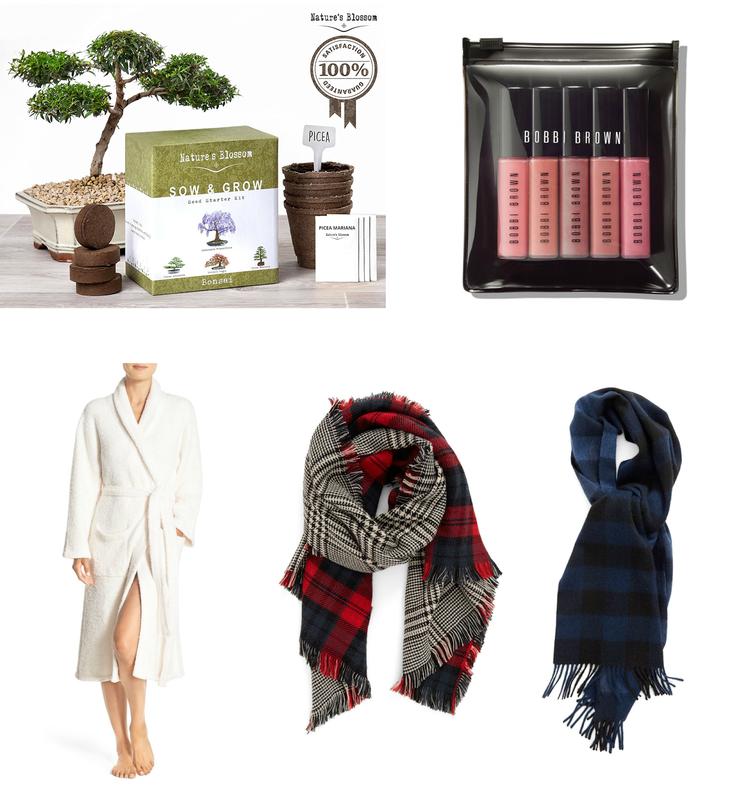 In addition to the wonderful gift box from Spilt Milk, I've decided to share some of my gift ideas to everyone so that you can hit the ground running in gift giving since Christmas is just around the corner! Nature's Blossom Bonsai Tree Kit - For those who want more of a challenge than the air plant, I think Bonsai trees are an amazing gift. Especially for those with a family, it can turn into valuable family bonding time with children as they learn how to plant the seeds and watch them grow together! Bobbi Brown Mini Lip Gloss Set - Gifting makeup can be tricky but almost everyone can use a good moisturizing lip gloss, even for those who don't wear makeup! I love this set as it comes in an array of colors, from bold to natural, and it will take you from work to play! They're also infused with Jojoba and avocado oils for some serious hydration. Scarves for Him and Her - These are a fashionable staples for the winter! I would go for classic and neutral colors since it's versatile if you don't know what their favorite color is. I also like the B.P. reversible one for your female friends because not only they're classic colors that go with everything, it's also like having 2 scarves in one.